Do your kids hate needles and shots? This new creation is easy to use and great for distraction and pain relief for kids (and even adults) of all ages! 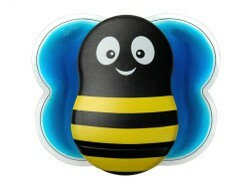 Buzzy is the new and fun way to distract your child and ease pain - especially when it comes to needles. This funky bright toy is so much more - it also vibrates, has an ice pack and is a general distraction for kids who hate needles. It's both affordable and reuseable. Buzzy was developed by a physician, mom, and pain researcher - and is a must have for any parent's first aid kit. Buzzy uses two methods to relieve pain - vibration and ice. With bright colors and shapes, he's also a great distraction for younger children of all ages. Buzzy can simply be placed above the painful area, before or during treatment, to help relieve and make pain almost unoticed. 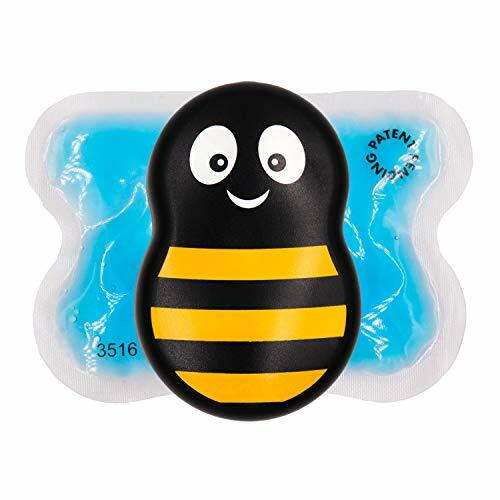 Buzzy can be used with two different ice packs - a blue reuseable gel pack or a white disposeable gel pack. Each pack takes about one hour to freeze. To get children used to the idea, you can let them experiment at home with Buzzy, so they're familiar with how he'll help them deal with their needle. What Can Buzzy Be Used For? Unlike many creams, gels and swabs which are made for treating a single type of problem, Buzzy is very versatile and can be used for a wide range of painful problems. Some of the areas that Buzzy will offer pain relief include needles, bug bites and stings, spliter removal, dentistry, allergies and plenty more. In fact, you can use Buzzy in almost any situation you'd normally use other types of pain relief such as ice, numbing cream or even pain relief pills. Is Buzzy Worth the Cost? Buzzy is worth every cent if you have a child that has had a bad experience with needles or is extremely scared of doctors. And with the only replacement you need for personal use being AA batteries, you can expect Buzzy to work out at approximately 9 cents per use. The white disposeable wings are fairly cheap and work out to a cost of approximately 29 cents per use. You can use Buzzy over and over again, simply by refreezing the gel pack. Where Can I Find Buzzy? You can buy your own personal buzzy, or in some areas, you can ask at your local hospital or doctor's office. 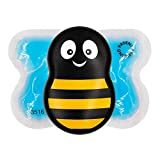 Developed in consultation with medical professionals, Buzzy is fast becoming a popular item for use in medical centres where children are often scared of painful procedures. Buzzy is also available to buy online and at some selected pharmacies and medical supply stores. Relief of backache, arthritis, strains, bruises, sprains, tendonitis and more. Salonpas passed this users test earning a 5 star rating. Pain relief for everybody and every pain. Learn about the common causes of middle back pain and the most effective natural and medical treatments for it.